In my previous article/tutorial, I’ve explained how to setup your own DNS-over-HTTPS (DoH) server using Nginx, Certbot, dnscrypt-proxy and dns-over-https. In this article I’ll explain to you how to add Pi-Hole into the mix to block the unwanted advertising. Pi-Hole is made of 2 components: a PHP web interface and a DNS server. Both are open-source. 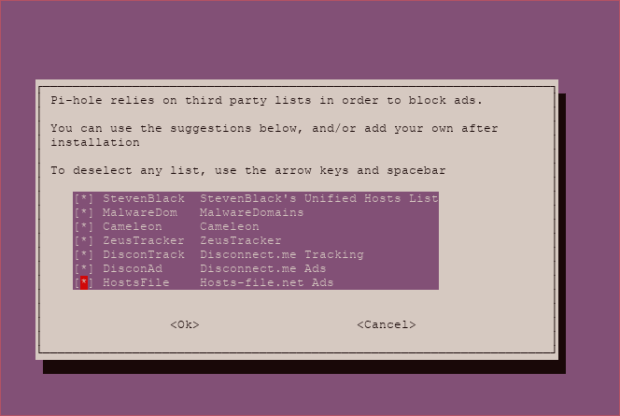 The web interface let you add blacklist, whitelist and configure the DNS server. The DNS server is the one doing the heavy lifting, responding to the queries according to its configuration generated by the interface. The name comes from the lightness of the application, it can run without problem on a raspberry pi in your own network. 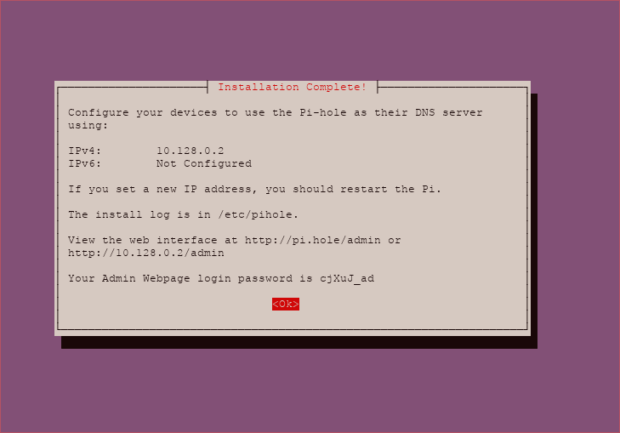 Installing Pi-Hole couldn’t be easier, you need to download their installer and run it. Check the screenshots before running the command, or simply, be sure to disable lighttpd. If you don’t want to use their installer, you try their docker image. 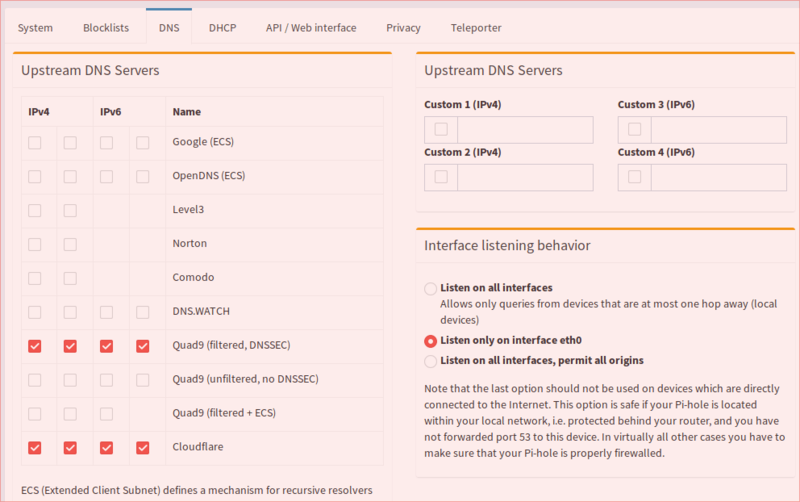 This section will mostly contain screenshot showing you what to do to configure your Pi-Hole for it to works with the currently installed dnscrypt-proxy. First select the Custom server, we’ll set directly the IP of our dnscrypt-proxy. Choose which blacklist you want. You’ll be able to add your own in the UI later. You can keep this as default. If your machine doesn’t have IPv6, Pi-Hole will detect it. To make things easier, I advise you install the Web Admin interface. We don’t want Lighttpd, since we already have Nginx. We’ll configure Nginx to serve the admin website. Continue the installation until the last screen where it shows you the full config and admin password. If you’re using Google Cloud Platform like me, the IP it shows is not the public one. You’ll need to go in your console in instance to get the public IP. Before connecting to the UI, we’ll run a configuration command to set the password to what we want. This will ask you to set a new password. 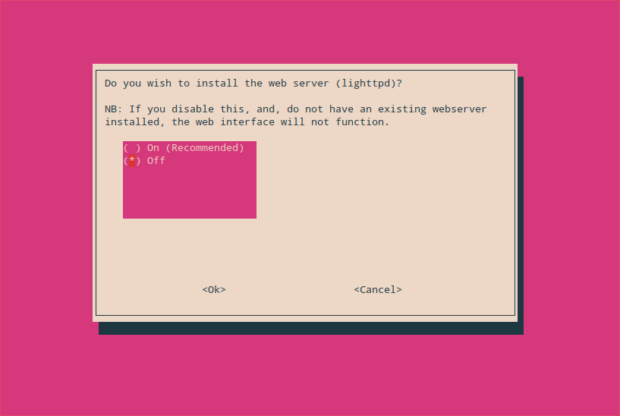 Since we don’t want to use lighttpd as webserver, we’ll have to configure Nginx. First we need to install PHP-fpm to take care of running the PHP website. Put the content of this file into /etc/nginx/sites-available/pihole. Don’t forget to change the server_name for your domain name. Be sure that IPV4_ADDRESS point to the public IP (WAN) of your machine, not the LAN one. Then edit the setupVars.conf file. This is done because the interface check if you’re accessing it from an accepted source. As before, let’s make this domain an HTTPS one. And Voila, the full UI is HTTPS and accessible with Nginx. 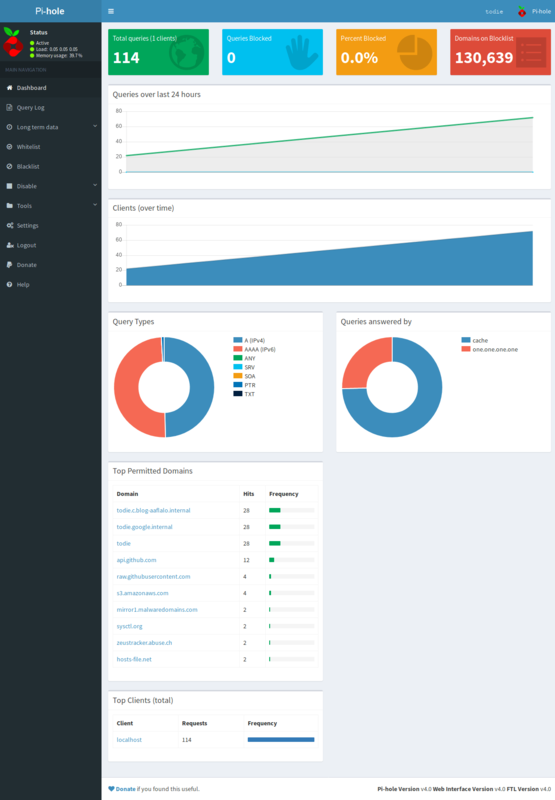 There are 2 UI, a public one containing all the stats of the server and the Admin one letting you administrate your Pi-Hole. Accessible at https://blocker.example.com/admin. (Of course, the domain name need to be replaced by the one you are using). This is the basic UI. Right now everybody can see this but only the Admin can add new blacklist/whitelist and configure the whole solution. Once you click on Login, you’ll see something different. You have more detailed statistics about the different requests done on your DNS Server. As you can see, I’ve just spawn the instance on GCP and I’m already getting scanned for DNS Server. There is a section about firewalling later in this guide. Basically we’re going to block the public port 53, since we don’t need everybody to do request to our Pi-Hole, only doh-server. Double check the settings to see if the installer did select the right DNS server. This what it supposed to look like. If it’s not the case, you can correct it. You can easily test your Pi-Hole server using dig. This well check for the domain test.com which is in one of the default blacklist. As you can see the answer for it is 0.0.0.0 which is the default answer for blocked domains. By default, Pi-Hole will return 0.0.0.0 for blocked domains. You can change this behaviour as documented on the official website. Personally I prefer to return NXDOMAIN for blocked domains, making the DNS clients think the domain doesn’t exists. If you want NXDOMAIN, do this command. Now that you have your Pi-Hole working, we need to reconfigure DoH-Server to use Pi-Hole as a source of DNS instead of dnscrypt-proxy. Change the upstream servers to 127.0.0.1:53. There you go you now have a DoH server with Pi-Hole. This is great, you have a fully working DoH server. But Pi-Hole like to listen on all interfaces. This is normal since it’s made to be installed on a Raspberry Pi in your own network with only a LAN interface. But with a server on internet, that can be more than problematic. Your server could be used to DNS Flood other servers. We don’t want that. We’re going to configure UFW to take care of the firewalling. First we want all the HTTP and HTTPS traffic to be open on our machine. HTTP is used for by Certbot when validating that the domain belongs to you. Obviously we want to be able to administrate the server. And now everything else should be blocked on Inbound. Now your server is firewalled correctly. Only HTTP, HTTPS and SSH traffic is accepted. I tried to use the same domain for both the dns and the pihole, did not work well. Do you have any suggestion for windows client? Well if you do use the same domain, you’ll have to setup nginx correctly to redirect trafic to /dns-query to the doh-server and the rest to the pihole. Personally, I use 2 domains, it’s easier. The only client I know is DNSCrypt, it takes sometime to set it up, but there are official tutorials in the wiki. Hello, I am having problems now, can you help me? How can I get it to open normally? Did you edit the /etc/pihole/setupVars.conf file and put the public IP of your machine ? I’ve made a couple of change to be sure that part is clearer. I’ve redone my tutorial without any issue using the same informations. You have to configure pihole FTL to only listen to one interface like eth0 or lo instead of all interfaces. You can set that in the admin panel. This is because Android 9 (Pie) uses DNS-over-TLS (DoT) not DNS-over-HTTPS(DoH). This is not the same protocol and setup. In fact, I’m planning to make a small guide how to configure DoT. I’ve finished the guide to add DoT to the DoH setup. Can you try your DoT server with this tool ? You put the IP of your server (public IP), the name of the TLS certificate (the domain name). I tried with my server where I have the same setup and it works for me. If it doesn’t can you comment on the other tutorial instead ? In case other people have the same issue as you and we correct it.